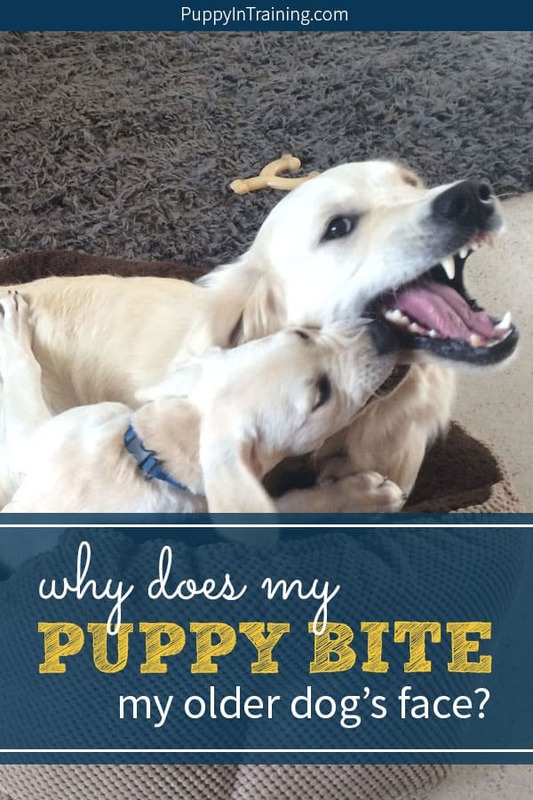 My puppy bites my older dog in the face!? What’s Going On? 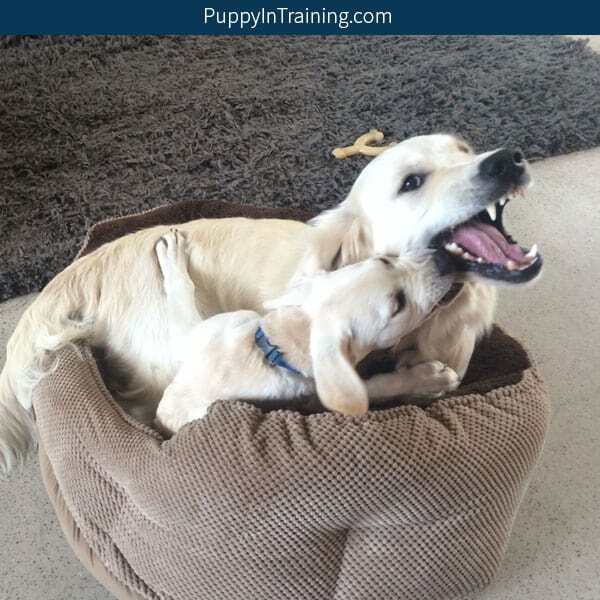 Do you notice your puppy biting your older dog’s face, cheek, scruff, and neck while making growly noises, showing teeth and in general making the most menacing looks and sounds a dog can muster? Do your ever watch this situation and wonder why does my puppy bite my oder dog’s face? To the untrained eye it sometimes looks like a dog fight, but make no mistake these two (Raven and Archer in the pic above) are having the time of their lives. We like to call this game Bitey Face and it can be played anyplace at anytime (not just in a doggy bed made for one). So what exactly is Bitey Face? QUICK TIP: Even if your pup’s like playing Bitey Face you may not want them engaging in this activity. One thing we do when we want Bitey Face to end is put our two puppies on a tie down with their favorite chew toy. One of their favorites are Bully Sticks. You need at least two dogs/puppies to play this game. Rough play is the norm. Grabbing cheeks, necks, scruff, faces is all part of the game. Growling noises while showing teeth is commonplace. The game of Bitey Face looks and sounds very scary, but most of the time it’s harmless play. Remember, a game of Bitey Face can escalate so you always want to keep an eye on the players. Does this sound like the same game you mentioned when you were wondering why your puppy bites your older dog’s face? Linus will play the game, but he has his limits and you can see as well as hear his mood change when he’s done playing. Archer will test Linus’ limits, but it’s sometimes wiser for the humans to get involved. Make sure you (the human) break up play if you see a change in either dog’s mood. Archer will try to engage Stetson in a game of Bitey Face, but to no avail. While Linus has his limits and Stetson calls “no joy” Raven will indulge Archer for a full 12 rounds of Bitey Face. They will go head to head like a bout between Ali and Foreman. It’s the Rumble In The Jungle Baby! Raven teaching Archer the Art of Bitey Face. QUICK TIP : Another way to break up a game of Bitey Face is by separating your puppies and giving them both a puzzle toy to play with like the Dog Brick Puzzle Toy by Nina Ottosson. If your dogs engage in Bitey Face it’s usually harmless, but you still want to keep an eye on your dogs to make sure a real fight doesn’t break out. Either dog looks tense, moving stiffly or staring. Dog’s ears, mouths, tongues are not in a relaxed position. One dog appears to be trying to get away from the other dog. One dog is always on the top of the doggy pile. Rough play will sometimes go on for too long and one of the combatants can get overstimulated or aggravated with the other. Not all dogs enjoy playing bitey face. Always keep a close eye on your dog anytime he plays with other dogs. If he’s playing bitey face make sure to break up play every once in a while to give the dogs a break. If your dog is still overstimulated you can try leashing him or putting him on a tie down and giving him a chew like a Himalayan Dog Chew until he calms down. That’s Bitey Face! So, how about your dogs? Does your puppy grab your older dog’s face, neck, and cheek? Do your puppies enjoy a good game of Bitey Face? Tell us a little about the doggy games your furry friends like to play in the comment section below. UPDATE: We’ve learned over time is that friendly games of bitey face can often escalate. A quick tip for puppies engaging in bitey face is to remove collars so your puppy’s jaw does not get stuck in the collar of the other puppy. You also might notice that some puppies modify the game by also biting and dragging the other puppy by the collar. Another safety measure is to use the PetSafe Break Away Collar which will break free if the collar happens to get snagged on a puppy’s teeth or any other object like a kennel, fence, bush, crate etc. Keep your puppies safe and always supervise play time. Why does my puppy bite my older dog in the face? I just got an 8 week old female olde English Bulldogge and I have a 6 month old male olde English Bulldogge. They play bitey face and she is so rough with my make that she leaves his jowls bleeding. He hasn’t corrected her at all. He mouths her and he has cried twice, but she doesn’t stop. I have been intervening when she gets too rough with him. How can I help to stop her from leaving him bloody? Should I stop play when she’s clearly had enough? Help, please! 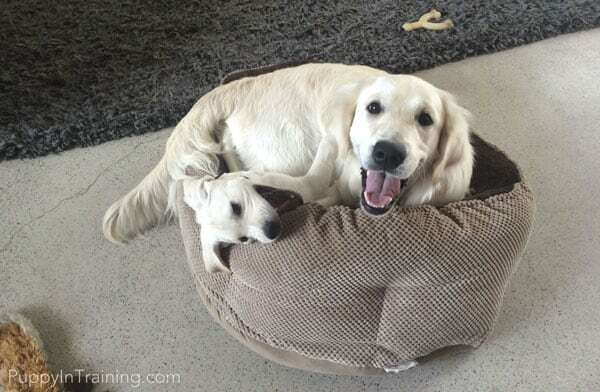 Congratulations on your new puppy! When my puppies play to rough I make sure to keep a close eye and separate them whenever necessary. My Stetson is like you’re 6 month old. He never corrects the puppies and just lets them chew on his jowls. Good luck with your puppies! My dog does little tiny bites to my other dog on her cheek. Not aggressive at all. Just wondering why? It’s tough to tell without seeing your dogs, but it could be that they’re playing bitey face. We do always monitor our puppies when they are playing to manage their play so it never gets out of hand. Congratulations on your new puppies! If these were my puppies I’d manage the behavior of the larger puppy with a leash that way you can control her behavior and not allow her to get too rough with your little pug. Good luck with your puppies!